<firstimage=”//static.makeuseof.com/wp-content/uploads/2011/08/GoingToBed-300×300.png”> Are you one of those geeks with dozens of awesome gadgets and a secret passion for books? Did you love reading as a kid and want your kids to enjoy books as well? Despite the obvious attraction to real paper-based books, the digital world has begun to create some really special adaptations of great stories. These somehow blur the line between books, movies and games, by providing a story in page-by-page format, interactivity and audiovisual segments. They’re also usually highly customisable, enabling parents to choose how much glitz to add to an already-worthwhile story. Take a quick look at two prime examples of the new interactive picture book market. The Fantastic Flying Books of Morris Lessmore is a story which started as a short film and then was adapted to become an interactive book for the iPad. Both the film ($2) and the iPad application ($5) version of the story are available to purchase, which is good news for people without an iPad. Moonbot Studios have created something very special with their iPad application. You can make the pictures animated, add music and sound effects, or remove everything and read it as just a straight book. On every page there’s something interactive: wind, books, piano keyboard. It’s all there. Readers can get quite engrossed in the story as they’re actually helping the story to be told. View the book in action on this Vimeo clip. 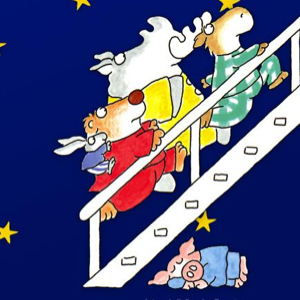 The Going To Bed Book is a book which has long been available as a real book and has recently been released as an Android application for around $2. This eBook also has interactivity, sound effects, short video movements, voice-over and numerous choices for parents and kids to make. An especially good feature is the ability to choose “I want to read it myself“, but will pronounce a given word if the reader taps on it while reading. These little things help kids to teach themselves how to read books – and their usefulness can’t be overlooked. Plus, the kids get to experience books in a way that just wasn’t around when we were young. The magic of being able to move your favourite characters about, listen to them speak and watch events unfold must be captivating for young kids. Perhaps this halfway concept will convince more kids to take up reading rather than movie-watching. View this book in action on YouTube here. These books are an excellent concept for where kids eBooks could be heading, besides also being great stories. They seem to be appearing at a rapid rate for a number of different devices. Hopefully, soon all these books will be available for all smartphone and tablet devices. Have you found any similar free eBooks for kids? Which ones do you recommend?